This folder is a spectacular piece of workmanship suitable for any knife enthusiast's collection. 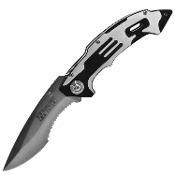 Unique, aluminum embellishments decorate both sides of this premium knife, giving this a sleek, futuristic design, reminiscent of design used in its cinema name-sake. Durable all-metal belt clip is securely attached to the back of this knife with screws; not rivets! This goes the same with the rest of the construction of this knife. Screws are used throughout the rest of this piece, which should last a lifetime.